Few would argue that this nation's health and health care system is, quite simply, a mess. In less than 9 years, health care in the United States is projected to cost $3.6 trillion or about 19% of the gross domestic product (GDP). Insurance costs throughout the country are skyrocketing, prescription drugs are unaffordable, there is a severe shortage of nurses, and individual health is worsening. Recent research studies have shown a significant increase in obesity among America's children and adults, which leads to major health problems such as heart disease and diabetes. One of the most effective ways to reduce health care costs and keep our families healthy is to educate people about how to take better care of themselves, thereby decreasing the necessity of having to seek care in the first place. There are 2.7 million nurses who work on the front lines in the United States' health care system. We must find a way to empower them and enhance their role. Nurses are uniquely qualified to provide education to the public in order to decrease our dependence on a health care system that is not only expensive but at times inaccessible, especially for those without health insurance or who live in rural areas. Not only do nurses have years of education and experience; these men and women are considered the most honest, ethical and trusted professionals, according to a recent Gallup poll. It is the nurse the patient trusts to explain the care and treatments ordered by his or her health care provider. It is the nurse who teaches a new mother and father how to bathe and feed their newborn. It is the nurse who explains how to provide comfort measures to a family member whose loved one is dying. Meanwhile, the Surgeon General is invisible. If you went to a local supermarket and asked ten customers to name this individual, let alone describe his role, you would be hard pressed to find a single person who could do this. Therefore, I propose in the strongest possible terms that we establish an Office of the National Nurse. The role of the National Nurse would highlight education through a fifteen-minute weekly presentation broadcast live to the nation, and later be available on the Internet. Experts from each of the fifty states would take turns creating the content and educational materials in English and Spanish. The main emphasis would be on primary prevention and include ways to avoid health problems before they happen; for example, how to have a healthy heart or raise your teenagers without going crazy. This Office of the National Nurse would affect the population on many levels. Through the Office of the National Nurse, nurses would sign up for a National Nurse Corps with the purpose of organizing and coordinating activities that promote and enhance health in their communities. 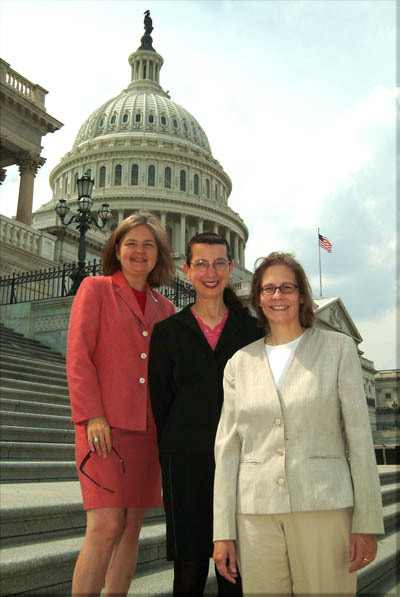 The Office of the National Nurse would have a legislative component as well, for example, acting as advisors on how to simplify Medicare paperwork or finding solutions to the nursing shortage. An Office of the National Nurse won't solve all of our country's health care problems. However, allowing America's most trusted, beloved nurses to utilize their education and experience will definitely help improve the situation. Florence Nightingale and Clara Barton would be proud to see America's everyday heroes be re-defined as National Nurses. Over the next several days, I hope to give you an idea of some of the meetings we attended during the National Nurse Team's visit to WA DC. We spent Tuesday visiting members of the House of Representatives, including the three nurses in Congress. All were aware of the call for a National Nurse and were familiar with my NY Times op/ed, America's Nurse, published on May 20, 2005. 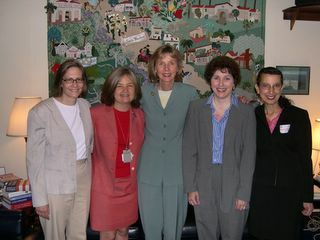 Representative Lois Capps, pictured with this post, is a nurse and an avid supporter of nurses. She leads the Nursing Congressional Caucus. We will be working closely with her health policy aide, Jeremy Sharp as we continue our quest for a National Nurse. Representative Capps, it turns out has many ties to Portland, Oregon. Her sister even graduated from Portland Community College's Nursing Program where I teach. In turn, my niece, Lisa, who attends UC Santa Barbara, voted for the Congresswoman during the last election. It was truly an honor to be so well received and exciting that Jeremy Sharp also spent a great deal of his time with us.